Circa 1925. Made by the A Schoenhut co. of Philadelphia, PA. Schoenhut made Ukuleles, Banjo Ukuleles and a host of "Childrens" Musical instruments such as xylophones, and a glockenspiele. Albert Schoenhut was born in 1848 in Wurtenberg, Germany, to a toy-making family. His father and grandfather made wooden dolls, rocking horses, and wagons. In 1872, Albert branched out on his own making pianos. The Schoenhut Company is still in business today making a wide range of Toy pianos. 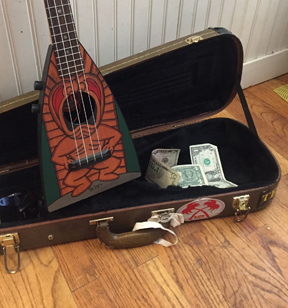 In 2012, Schoenhut began producing a Schoenhut branded, low priced, chinese made knock-off of Magic Fluke Co.s famous Flea Ukulele Under license from Magic Fluke.